Growing up in Boston during the late 1950s and 60s, I was far from the front lines of the Civil Rights Movement in the south. I was not part of the sit-in at the Woolworth’s lunch counter in Greensboro, North Carolina in 1960. I wasn’t in Montgomery, Alabama to be beaten on the Freedom Rides in 1961 or jailed in Jackson, Mississippi. I was not in danger of being attacked by police dogs or blasted by firemen’s high-pressure hoses during the marches in Birmingham, Alabama in 1963. And yet, the Boston of those years also contained a vibrant, integrated civil rights community. Its energy and optimism sprang from both black Boston’s long history of fighting for equality — the local struggle to integrate the Boston schools would lead a decade later to the momentous 1974 federal court school desegregation order — and its direct connection, via individual friendships and church and community-group alliances, to the Movement in the south. The most dramatic example of that connection was Martin Luther King, Jr. himself. Many black Bostonians knew Dr. King and his wife, Coretta, from their years as graduate students in the city: he at Boston University School of Theology; she at the New England Conservatory of Music. That included Reverend Michael E. Haynes, then pastor of Roxbury’s historic Twelfth Baptist Church, who would become one of my most important mentors. The two men had been co-junior pastors at the church in the early 1950s before Dr. King was called to lead the Dexter Avenue Baptist Church in Montgomery and just before Rosa Parks’ defiance of Jim Crow laws led to the Montgomery Bus Boycott. They would remain close friends all the remaining years of Dr. King’s life. Dr. King’s years in Boston and his friendships with ordinary black Bostonians that I myself knew, symbolized how fluid and intimate the bond was between the Movement’s “leaders” and the masses. That truth was powerfully on display at that very moment as local activists — some of them the parents of my own friends — were intensifying their demands that school officials stop segregating the city’s elementary and middle schools. My brother and I joined a church-based “freedom choir.” We eagerly participated in the one-day student public school boycotts in 1962 and 1963 so we could instead attend “Freedom Schools” in local churches to learn more about the Movement in the South — and in Boston. Use our lesson, "Dr. King's Legacy and Choosing to Participate," to explore Dr. King's last speech before he was assassinated. 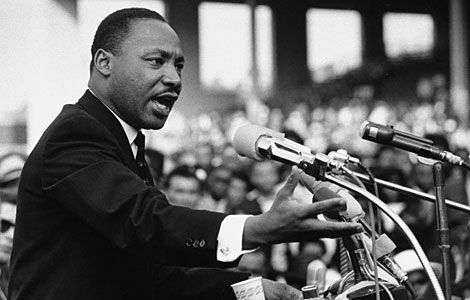 Challenge students to use his speech and his legacy to consider how they might “choose to participate” in creating of a more just community, nation, or world.